Do you tend to run late, early, or right on time? 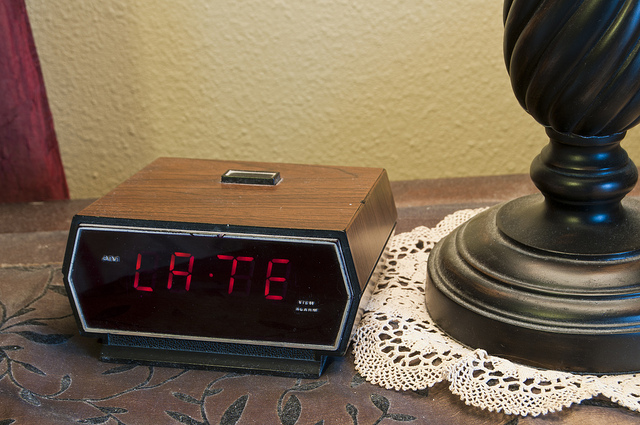 If you tend to run late, are you tardy for everything or just certain activities? Yes, I want you to take a moment and really answer these questions! If you are usually on-time or early, you can stop reading now. If you are regularly behind schedule, this post is for you. Step #1 Determine when you are late. Is it for work or personal appointments? Is it a certain type of appointment or when you are meeting certain people? Maybe you’re often tardy when you meet friends because you’re completing something at work. Possibly you’re delayed getting to work because you’re finishing up at the gym. Perhaps you’re finishing a task needed for the meeting, so you arrive at the meeting late. For the sake of this post, choose one recurring and specific example. Case in point: You meet a group of friends for dinner at 6:30 p.m. on the first Tuesday of the month at a restaurant three miles away. You are commonly 15-30 minutes late. Step #2 Discover what causes you to be late. How long does it take you to get there? If you answer five minutes, I’m going to challenge you on that! How long does it take to get from your office to car? If your office is right by the stairs and your car is parked directly outside the door near the bottom of the stairs, you’ll get your car more quickly than if you have to walk down a long hallway to get outside before you cross the large parking lot to get to your spot. Once you get to your car, how long is the drive to the restaurant? If you make a right turn out of the parking lot and drive three miles in little traffic with no stoplights, it’s a quick trip. If you have to make a left out of the parking lot without a light, the time increases. Likewise, heavy traffic or several badly timed traffic lights impede your ability to get there quickly. How far do you have to park from the door of the restaurant? A large parking lot adjacent to the restaurant is more convenient than a parking garage with a slow elevator that is 50 yards away. What time do you leave your office? What time do you really exit versus what time you aim to depart! How often do you leave at your intended time? If you believe it takes you five minutes to get there, how often do you leave at 6:25 p.m.? When you don’t leave at 6:25 p.m., what time do you depart? Do you know, or do you just rush out the door knowing that you are tardy but not by how much? What usually causes you to leave later than 6:25 p.m.? Do business meetings consistently run over? Do you have “one more thing-itis”? Case in point: Reality is it takes you five minutes to get from your office to the car. Then, due to time of day and traffic patterns, it’s another 15 minutes to the restaurant. Even if you leave at exactly 6:25 p.m., you’ll never be at the restaurant at 6:30 p.m.
At the start of the workday, set a timer for 6:10 p.m. If you use an electronic calendar, set the beginning time of dinner for 6:00 p.m.
Get to work earlier so you can park closer to the entrance of your office. Schedule a business meeting for 5:30 p.m. at a coffee shop within walking distance of the restaurant. Second, experiment with the one you selected. Third, re-evaluate after three months. If the one small change means you get to the restaurant on time, that’s awesome! If not, you might need to change which suggestion you’re doing or possibly add something else to your routine. Case in point: You choose to create the dinner appointment to start at 6:00 p.m. At the three-month evaluation, you realize that you were on time once and only 10 minutes late the other two times. You’re pleased with your efforts, but you’d like to do better. You determine that you find it difficult to stop work. You decide to set a calendar reminder at 5:30 p.m. as a way of pausing whatever task you’re working on. When the alarm sounds, you’ll pick a good stopping point which will allow you to get out the door on time. I know this process may sound hard but changing from being late to being on time is a habit adjustment. It’s not going to happen all by itself. Feel overwhelmed by the effort needed to become a timely person? A crucial element of organizing your time is developing meaningful habits. As one of the components of our Flexible Structure Method, the Minding Your Matters team is adept at helping people create more functional routines. Let us know if you need help establishing new practices in your work or personal life. By signing up, you agree to receive email communications from us. You can unsubscribe at any time. Janice Russell | 919-467-7058 | Certified Organizer Coach | By using this site, you agree to the Terms and Conditions associated with Ordered Minds and its parent company, Minding Your Matters®, Inc. © 2010-2017, Minding Your Matters®. All rights reserved.